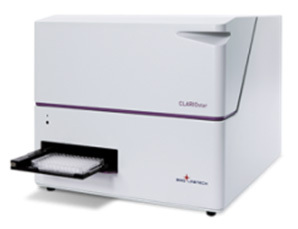 SBH Sciences has a newly acquired instrument, the CLARIOstar, to bring you even more versatility and assay options. The CLARIOstar is BMG LABTECH's newest microplate reader and it is the only reader on the market available with the three technologies required to run any assay in your laboratory; patent-pending LVF monochromators, UV/vis spectrometer, and high transmission optical filters. The CLARIOstar does not compromise in sensitivity or flexibility, instead providing you with the tools to choose what is needed for your application. Time-Resolved Fluorescence Resonance Energy Transfer (TR-FRET) is a special form of resonance energy transfer (FRET) in which long emission fluorophores (lanthanides) are used as donors. The comparison measurement of the two emitted wavelengths over time is calculated for a TR-FRET response. The most common TR-FRET assays include HTRF®, LanthaScreen®, LANCE®, and Transcreener® ADP2 TR-FRET Red Assay. Amplified Luminescent Proximity Homogeneous Assay (Alpha) Technology, commonly known as AlphaScreen® and AlphaLISA®, is a bead-based detection mode which measures the interaction of two molecules bioconjugated to donor and acceptor beads. When excited at 680 nm, the donor bead produces singlet oxygen. If the acceptor bead is within a 200 nm distance, the singlet oxygen transfers energy to the donor resulting in production of light between 520 and 620 nm. The amount of produced light is directly proportionate to the amount of bound donor-acceptor beads. AlphaLISA is slightly different from AlphaScreen in that the primary emission occurs at 615nm.